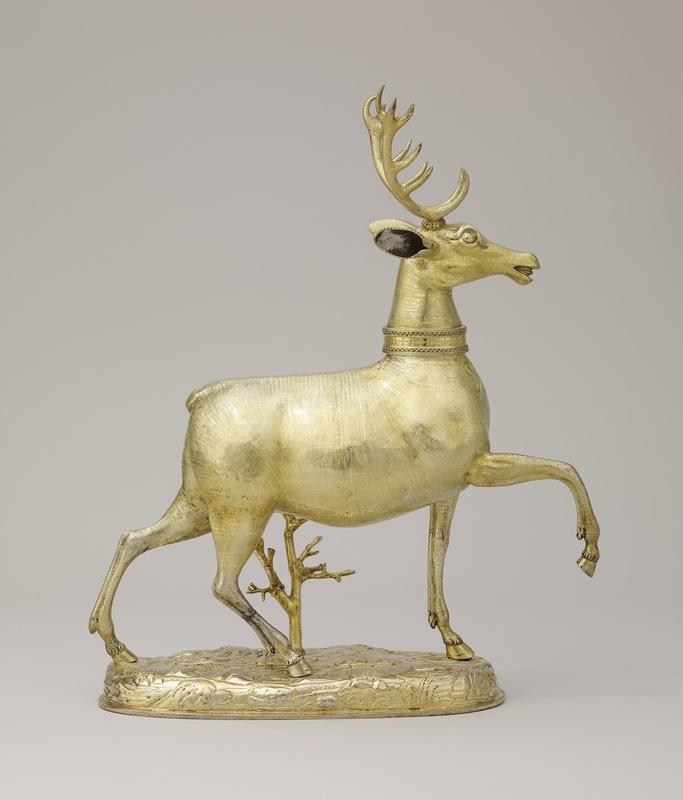 Standing cup; silver-gilt; chased; form of stag tripping; removable head; ornamented collar; oval base with stones etc; inscribed. from which springs a thorn tree; inscribed. Origin: Uncertain; previously attributed to Augsburg, late 16th century; mark of Christoph Erhart (master 1565, died 1604); a number of later additions. Marks: The pair of marks (the town and the maker's punch-marks) occur only once: on the narrow foot-rim of the base (at the front) and, consequently, part of the maker's mark is lost over the edge of the foot-rim. (i) Assay mark for Augsburg, after 1576 (R3 126 (?)) or, perhaps, Seling 29 (1600-10). (ii) The symbol incorporating the initials CE, within a circular stamp: the punch-mark of Christoph Erhart (R3 366; Seling no. 763). Commentary: For a brief biographical note on the maker, Christoph Erhart, see WB.137. The very summary treatment of the embossed and chased base is noticeably less accomplished than Christoph Erhart's fashioning of the similar base for the stag tripping cup (WB.137), which included a curious armadillo-like animal and other creatures. Similarly, the insensitive tooling of the long hair on the chest of the stag is crude and deep, but more especially the chasing of the short hair is far less close and fine than on Erhart's stag tripping cup. A further oddity on this stag with thorn tree is the way in which the long hair on the chest of the stag does not continue all the way up to the rim, whereas the chasing of the short hair not only continues to the rim but fills in the space above the top of the long hair. This odd feature is hidden by the collar when the head is in position. This manner of chasing the hair does not agree with Christoph Erhart's method on the other stag cup, where the very fine chasing fades out in an irregular fashion just below the rim, leaving a plain surface where the silver was worked and finished off. Finally, when the body of this stag with thorn tree is seen in profile it has a rotund, sagging belly, unlike the usual stag cup. The cast head of this cup neither follows the line of the stag's body nor does it continue the long hair of the chest up around the neck (above the collar). The short hair on the head is again represented by an insensitive broad tooling that lacks finesse. The design of the collar and its decoration is a most unconvincing pastiche of the Renaissance style; indeed, the dots and dashes are also monotonously and feebly executed. This cup, with all its dubious characteristics, should be compared with a documentary piece made in 1586 by Abraham Altermann I, a goldsmith of Stuttgart. It is struck with both the punch-mark of the town and of the maker, and set on the chest is an enamelled roundel bearing the arms of Duke Ludwig von Württemberg (1554-93). This historic piece was lent from a private collection in Switzerland to the Exhibition in Heidelberg Castle in 1986 (see R. Sänger, Gold- und silberschmiedekunst , Bergkristall- und Steinschneidearbeiten, ‘Die Renaissance im Deutschen Südwesten’, exh. cat., Heidelberg Castle, Badisches Landesmuseum, Karlsruhe, 1986, p. 633, no. L. 30, with illus. ; also Werner Fleischhauer, ‘Die Renaissance im Herzogtum Württemberg, Stuttgart’, 1971, p. 222, pl. 119). It is especially relevant because the very similar base is embossed in an equally broad and summary fashion with grass, plants, stones and rocks. The long hair on the chest of the stag is also tooled in a broad, wavy fashion that lacks finesse, but nevertheless it is rendered in a more sensitive and lively way - and it continues on both the front and back of the neck above the broad collar. The shape of the head of the stag is not unlike the cast head on this stag cup, but the modelling is more subtle and the ears are not given 'serrated' edges. The collar is ornately decorated with strapwork enclosing bosses in a typically late sixteenth-century manner. Finally, the body of the Württemberg stag, in profile, is modelled in the usual slim outline, with no hint of a sagging belly. In conclusion, neither the tooled cast head nor the similarly tooled body of this stag cup seems to conform to the standards of the late sixteenth century in Augsburg. Goldsmiths of the calibre of Christoph Erhart may not always have performed to the highest standards, and no doubt in his later years his work may have become broader and less meticulously finished. Consequently, it may be argued that the base and the body of this stag could at best be the products of his declining years and that the replacement head was made to match, albeit without much skill or taste. Franz Schestag, ‘katalog der Kuntsammlung des Freiherrn Anselm von Rothschild in Wein’ Vienna, 1866, no. 209, with illus. Heiner Borggrefe, Vera Lüpkes & Hans Ottomeyer, 'Moritz der Gelehrte : ein Renaissancefürst in Europa', Weserrenaissance-Museum Schloss Brake. Orangerie, 1997, no.206.